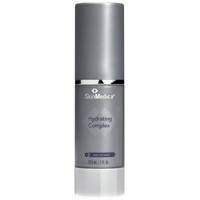 SkinMedica Hydrating Complex - 1oz. Replenishes moisture and provides instant hydration to skin. SkinMedica Hydrating Complex is a hyaluronic acid rich serum that replenishes skin's moisture reservoir and provides instant and long-term hydration. Using this complex will significantly enhance the benefits of your daily moisturizer, giving you softer, smoother and more hydrated skin than using a moisturizer alone. Stimulates the skin's natural production of hyaluronic acid. Protects the skin against the degradation of hyaluronic acid and elastin. Helps maintain firmness and elasticity. Penetrates into the skin and retains the skin's moisture level by forming a hydrating film at the surface of the skin. You're reviewing: SkinMedica Hydrating Complex - 1oz.